He wanted to have the ball in his hands as often as possible, attacking to score or setting up his teammates for quality looks. Morris scored 20 points and dished out a career-high 17 assists as RGV snapped its losing skid, beating the South Bay Lakers 124-118 at State Farm Arena. 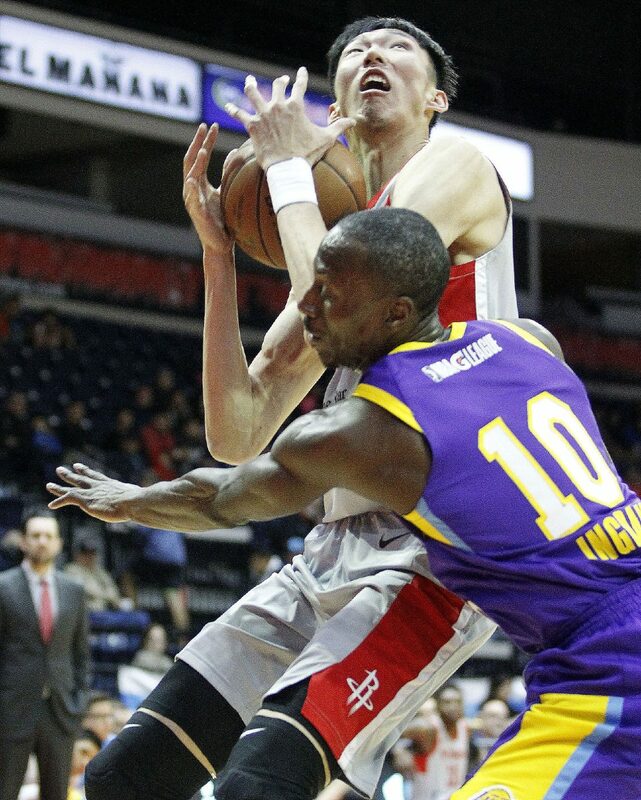 Vipers Zhou Qi is defended by South Bay Lakers Andre Ingram in the first half of an NBA G League game at State Farm Arena Thursday Jan.04,2018, in Hidalgo. Vipers Monte Morris on a drive to the basket against South Bay Lakers Andre Ingram in the first half of an NBA G League game at State Farm Arena Thursday Jan.04,2018, in Hidalgo. The win lifts the Vipers to 16-9 on the year, passing the Lakers (14-9) for the best record in the G League’s Western Conference. Zhou Qi led the Vipers in scoring with 23 points, while Tyler Lydon had 19 points with 14 rebounds, Cleanthony Early had 19 points and Isaiah Hartenstein had 18 points with seven rebounds. RGV scored 78 points in the paint and shot 57.0 percent from the field, including 67.3 percent in the first half. The Vipers shot 71.7 percent (43 of 60) on 2-point shots. Morris and Brase credited the team’s forwards for getting open on backdoor cuts to the basket — something Morris said he expected to be open against a Lakers team that attacks passing lanes on the perimeter. On 2-point shots, Zhou was 9 of 10, while Lydon and Early were each 8 of 10. Hartenstein also did most of his scoring on rolls to the basket, converting all nine of his shot attempts. Brase credited him for sticking to his strengths. Hartenstein was playing Thursday’s game with a bandage above his left eye after suffering a cut that required stitches when he was elbowed during Tuesday’s game against Northern Arizona. He said he played through a headache and that his eye occasionally twitches shut. “But in general, it’s OK. I guess I was OK. I went 9 for 9, so,” Hartenstein said, laughing. The Lakers held the lead for the last time at 48-47 early in the second quarter before the Vipers went on a 21-2 run. RGV maintained that cushion most of the rest of the way, ballooning its lead as large as 21 early in the fourth quarter before South Bay started to claw back. The Lakers pulled as close as three points twice, first moving within 116-113 with 1:47 to play. Zhou answered with a putback to extend RGV’s lead to five, but South Bay again pulled within three on a pair of free throws. The margin was still 118-115 in the final minute before Zhou knocked down a 3-pointer with 44.9 seconds remaining to ice the game. For much of the early part of the season, the Vipers and Lakers held the best records in the G League. The Lakers jumped out to a 10-2 start through Dec. 8 — the day the Vipers capped a 13-game win streak to move to 13-3 on the year. Since then, both teams have had middling results. 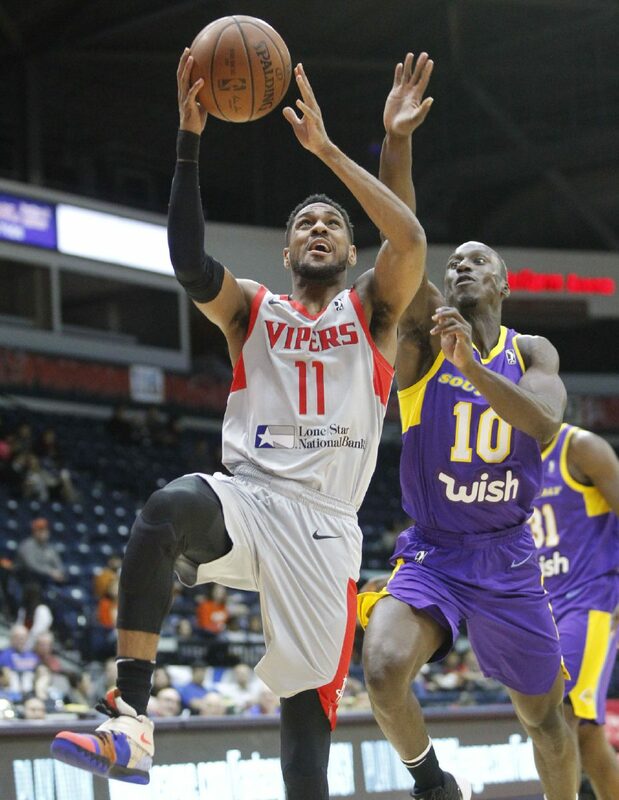 The Vipers entered Thursday at 15-9, having lost five of their past six games, while the Lakers came into State Farm Arena at 14-8, having lost four of their past six. The squads still held the two best winning percentages in the Western Conference, with the Vipers leapfrogging the Lakers for the West’s best mark on Thursday.